This section assumes that you have pre-drilled your front and rear panels (for the jacks, switches, etc.). If you haven't done so, see the boards & panels section for details and work on that first. You can print out an image of the circuit board silkscreen layer (PNG format | PDF format), to use as a guide for installing components. Do not remove the integrated circuits from their sealed packaging until you're ready to solder them on the board. This is to protect them from electrostatic discharge and moisture. While you look at the board layout, please also take the time to check the schematic diagram and associate each part with their location in the circuit. While this is not normally required to build a working DAC, one of the opportunities of DIY is to learn about how the circuit works. Try to determine what each part does and why the particular part or value is chosen. There are many web resources to help you with this, including the γ2 project thread in the head-fi.org DIY forum. You will find the overall DIY experience more rewarding as a result. Read Using γ2 standalone below if you are not pairing it with a γ1. Otherwise, read the γ1 website first. Build and test the γ1 board before working on the γ2. If you are using a previously-built γ1, read the Upgrading a previously-built γ1 section below. The γ1 board edges need to be sanded down slightly in order to fit the Box B2-080 case. See the γ1 website "instrucions" section (regarding the Full++ configuration) for details. The γ2 board does not need to be sanded down. Some parts are optional. Be sure to read the Overview, Tech highlights, and the Parts list sections to make sure you understand the options, and instal only the needed parts for the configuration you're building. The 9P pin header (SIP-9) should be carefully cut apart into a 3-pin segment and a 5-pin segment (with 1 pin leftover). The 3-pin and 5-pin pieces are to be used as J4 and J5, respectively. If your γ1 is the Full (A), S/PDIF-only (E) or Full++ (F) configuration, then the "leftover" pin from the 9P pin header (SIP-9) should be installed in γ1's JP1D pin 2 (round pad), to mate with the matching receptacle at γ2's J3 (see picture below). The PCB-mount RCA jack has two square pegs at the bottom of the jack body, along the front edge. These pegs must be cut off before you solder the jack to the board, or it will not sit level on the board. Also, the AMB CNC-machined panel set assumes this, if you don't cut off the pegs then the jack won't line up with the panel hole. The resistor networks are polarized. Pin 1 is marked on the part with a "dot" marker. The board has a square pad for pin 1, and round pads for the other pins. For the various jumpers (JPx), if you don't plan to change the settings, there is no need to populate them with pin headers and jumper shunts. You may leave an "open" jumper completely unpopulated, and you can solder a piece of clipped resistor lead to make a "shorted" jumper. See "Jumper settings" below. Note: The "_" character denotes a variance code or for the manufacturing facility and could vary. Clean both sides of the blank γ2 board with paper towel and isopropyl alcohol or electronics flux remover, then solder the components to the board, beginning with all the SMD integrated circuits for maximum access. Apply liquid flux to the board solder pads, and place the chip over the pads. Use the tweezers to pick and nudge the chip until it is centered and aligned perfectly. Be sure that the pin orientation is correct. Most chips have a dot marking next to its pin 1. The board's silkscreen is also marked accordingly. Some chips have a beveled edge on the side where pin 1 is located. Press the tweezer tip on the top of the chip to keep it from shifting while soldering. Apply only a tiny amount of solder to the tip of your iron, and tack down one corner pin of the chip. It helps to use a "wiping" motion of the tip on the pin and pad. If necessary, make small adjustments while heating that pad and pin again. If all is well, do the pin on the diagonally-opposite side. Then, do the remaining pins one at a time, reflow any pin that needs a bit of touch-up. 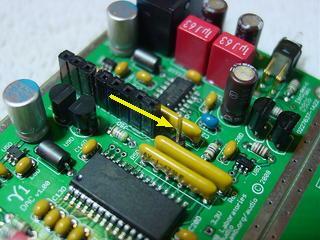 If necessary, use the desoldering braid to remove any excess solder, and be sure there are no solder bridges between the pins. Use your multimeter and check the resistance between each pin of the chip and the pad to make sure you don't have a cold joint (i.e., your meter should read close to zero ohms). Also check continuity between adjacent pins for solder bridges (meter should read infinity, except where the pins are supposed to be connected to each other, see the schematic diagram for verification). Repeat the above procedure for all the SMD integrated circuits. When you are done with all of them, use a Q-tip and isopropyl alcohol, or specialized electronics flux remover to clean off the flux. Since the γ2 circuit board holes are plated through, with the exception of the SMD integrated circuits, you only need to solder the parts from the bottom of the board. Do not drill or enlarge the holes because that would damage the through-plating. 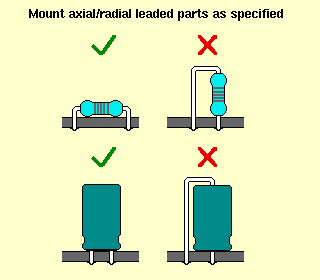 Make sure the correct part goes into each position on the circuit board. Measure each resistor with your multimeter to ensure it's the proper value before installing it. Pay attention to the polarity of resistor networks, electrolytic capacitors, reset managers and oscillator. For electrolytic capacitors, the positive lead should be the longer one. When soldering the RCA jacks and 3.5mm stereo mini jack, you should heat the solder tabs and pads sufficiently to allow solder to fill the entire hole. Remove heat immediately and cool the joint by blowing air at it as soon as you achieve a good fill. This assures that the jacks will be mechanically-secure. Clean up the solder flux residue from the board with isopropyl alcohol (or electronics flux remover) and a brush. Using your diagonal cutter, trim all protruding pins, leads, solder tabs, etc., on the bottom side as close to the board as possible to prevent a short circuit to the case after installation. Inspect all solder connections carefully, using a magnifying glass, to make sure there are no solder bridges or cold solder joints. Use a multimeter in ohms scale to check for short circuits. Correct any mistakes before moving on to the next phase. Set up the jumpers according to the following table, based on your build configuration. After circuit board assembly is complete, proceed to the initial check section to test the board before mounting the board in the case. If you had previously built a γ1 and is now upgrading to the γ2, this section applies to you. The γ1 USB-to-S/PDIF (C) configuration is not compatible with γ2, because there is no I²S bus. The DATA line from the γ1 USB board carries an S/PDIF stream. In all other γ1 configurations, if you have pin headers and a jumper shunt installed at JP1U, you should remove them and hard-wire the jumper with a clipped resistor lead. Without doing so, the γ1 and γ2 boards will not fit together properly. If your γ1 is a Full++ (F) configuration, remove the added wires that joined the γ1 USB and DAC board sections and install pin headers and receptacles for mating with the γ2. The γ2 board provides the "bridge" to link the two γ1 sections. If your γ1 USB and DAC board sections had been snapped apart, you will need to join them back together. Lightly sand the adjoining edges, then add resistor lead clippings into the ground strip holes to link the two board sections together. Align the two sections carefully, making sure that they are level and tight against each other, then solder the leads into the ground strips. Measure the distance between J2U and J4D to make sure that they will line up with γ2's J1 and J5, respectively. You may also run a bead of hot glue or epoxy along the adjoining edge for additional strength. After the glue sets, sand down the two outer edges of the re-joined board until it will slide into the Box B2-080 case slots. Be sure to sand off the same amount of material on each side. If your γ1 is a Full (A), S/PDIF-only (E) or Full++ (F) configuration, then you need to install the "leftover" pin from the 9P pin header (SIP-9) in JP1D pin 2. It will mate with the receptacle at γ2's J3 (see picture above). If your γ1 was housed in a Hammond 1455C80x series case, then you need to re-case into a Box B2-080. If your γ1 was a Full++ (F) configuration and already housed in a B2-080 case, you will need to make new front/rear panels for it based on the drawings in the Board & panels section, or obtain the CNC-machined and engraved panel set from AMB. This section applies if you are planning to use γ2 in a standalone fashion (i.e., without γ1), as an upgrade DAC for a device that has an I²S bus (such as a CD player or media player). How to locate and tap into the player's I²S bus is beyond the scope of this page. Be aware that modifying the player will void its warranty, and you may damage the player. Be sure you know what you're doing and proceed at your own risk. Build the γ2 board normally. you do not need to install a pin receptacle at J3, but you should short the JP1 jumper. A 5-wire ribbon cable is recommended for this purpose. The γ2 board may be embedded in the player if space allows, or mounted in a dedicated case (such as the Box Enclosures B2-080), and use an RJ45 or 5-pin Mini-DIN connector for the I²S umbilical. Such a cable should be kept as short as possible because I²S was designed to be an "internal" bus, and not intended to run over long wires. This section assumes that you have already done the initial checks of your assembled board(s). You may use the panel screws supplied with your case, but they aren't as attractive as socket cap screws. 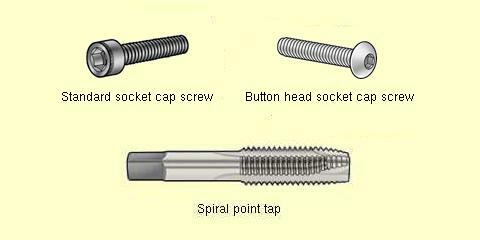 Also, the supplied screws are self-tapping, and are not designed to be removed and installed for many cycles. Eventually the screw threads would wear out. For this reason imperial #6-32 or metric M3.5 flat-head socket cap screws are recommended. These screws should be at least 3/8" (9.5mm) long but no longer than 3/4" (19mm). If you use the screws supplied with the case, installing and then removing the screws before the final assembly keeps you from getting pieces of aluminum all over the board. If you use #6-32 or M3.5 screws, you must first tap the case to match. Taps for your portable electric drill or drill press could be purchased from a tools and hardware store. It is recommended that you grind away some of the anodizing from the board slots, in order for the exposed ground plane strips on the boards to make contact with the case. This provides RFI shielding. You do not need to do this with Hammond's clear anodized version. Using the emery board or thin file, carefully grind along the board contact surfaces of the slots on each side, until you could see bare aluminum showing through. When you're done, clean the case of all metal dust and shavings. Insert the boards into the slot. Be careful while doing this to prevent any part of the circuit from touching the case. Be sure that the solder joints on the bottom of the boards do not touch the case. Use your multimeter to check the continuity between the sleeve ("circuit ground") of the inner 3.5mm stereo mini jack and a point where you could make good contact with the bare metal of the case (such as at the panel screw threads). You should get a low ohms reading. If not, remove the board, grind the slots further and repeat. Install the front and rear panels and fasten the panel screws. You're now done. Connect your digital source and connect the line out to your stereo preamp or headphone amp, and enjoy the music!